The first ascent of the route: S. Shelepov and D. Gorkovoy, Simferopol, 1995. From the upper road go firstly by the path, going into Kievsky couloir*, then straight upwards by the stone-slipping slope to the wall. Ascend on the rocky jut under the central part of the wall. 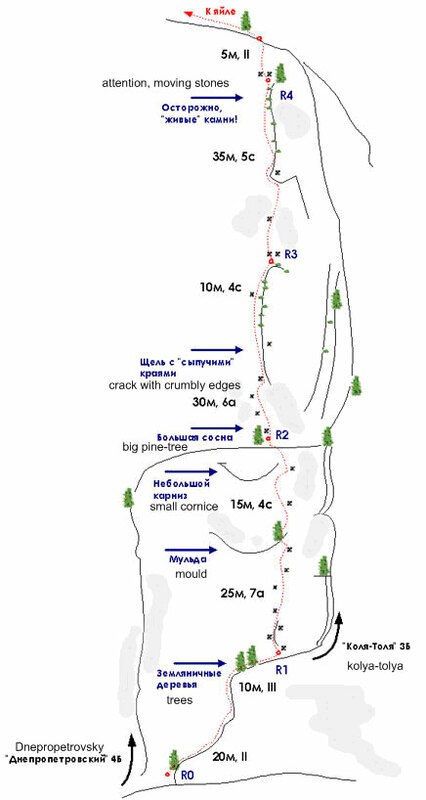 * Kievsky couloir is a couloir, dividing the peaks Zamok and Small Kilse. The beginning of route а coincides with the route " Коля - Толя (Kolya-Tolya)" 3 Б . 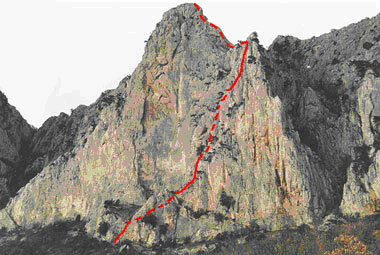 By the inclined rocks go to the right part of the wall to the crack leading to the ledge with madrono. Belay is on the bolt with sign "8 m арта (On March 8)". From ledge move to the left and upwards by the vertical slab with small crack, then traverse to the right and then go by the inclined slab to the tree. From the tree climb by easy rocks, bypassing on the right the small destroyed the cornice ascend on the ledge with big pine-tree. Belay point is a pine-tree and a bolt. In the beginning of section R1-R2 there are pin traces. Please don't use AID on the route, because holds can be destroyed and the route can become difficult for free climbing. From the pine-tree go to the left and upwards by the slab. Then move to the right and upwards to the crack, going into the corner. Attention - the crack has"friable" edges! Belay is on two bolts on the ledge on the top of the corner. Then go to the right and upwards by the inclined slab to direction of the corner and move along it till the big pine-tree. The destroyed section of the corner can be bypassed on the right. Belay is on two bolts. From pine-tree go 5m by easy rocks till the ridge. Then go along the ridge to the plateau. For safe ascent on the route in addition to quickdraws and carebiners a set of rocks is needed (nuts, friends).